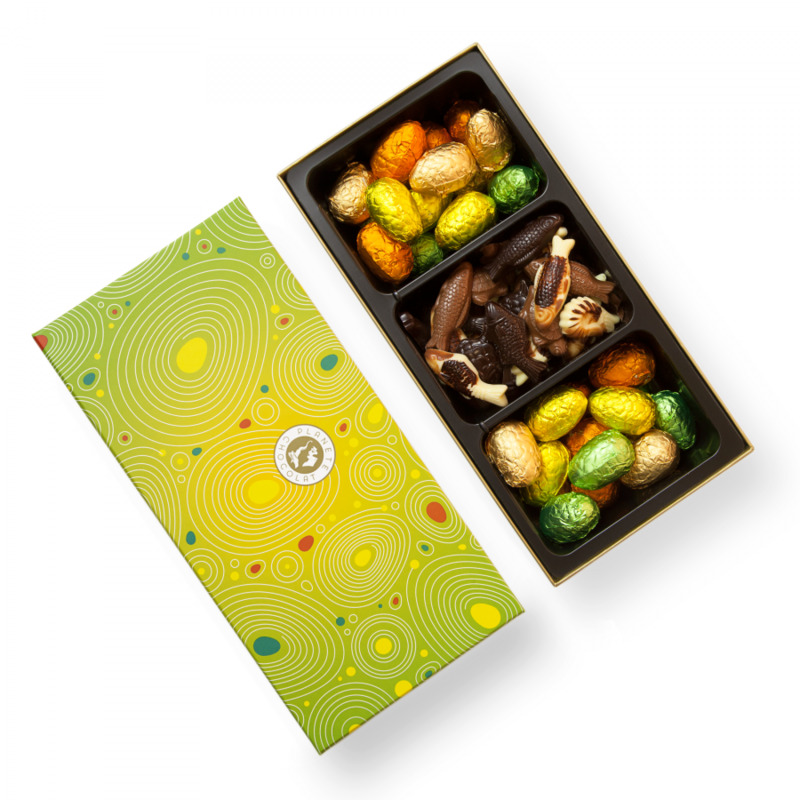 A box of colorful Easter eggs in the pure tradition of Belgian chocolate. The Easter egg hunt has started! 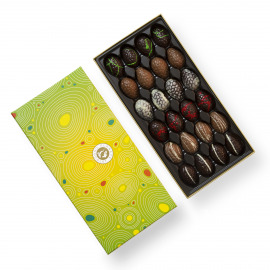 Since Easter is primarily a day of celebration for children, Planète Chocolat wanted to offer them the best possible rewards: several chocolate eggs in four flavors. Each flavor has educational packaging in gold and a different colored paper (gold, green, yellow and orange). Kids will love this colorful and playful idea and will easily distinguish the honey praline fondant egg, the praline crisp fondant egg, the milk chocolate egg with pieces of caramel and the white chocolate egg. 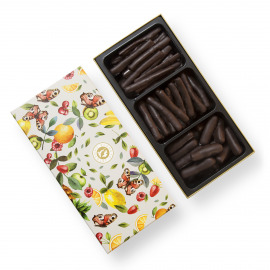 Sweets are arranged in the outer two trays of the spring colored box and the central tray has a few extra surprises: seafood shaped milk chocolate and fondant pralines. 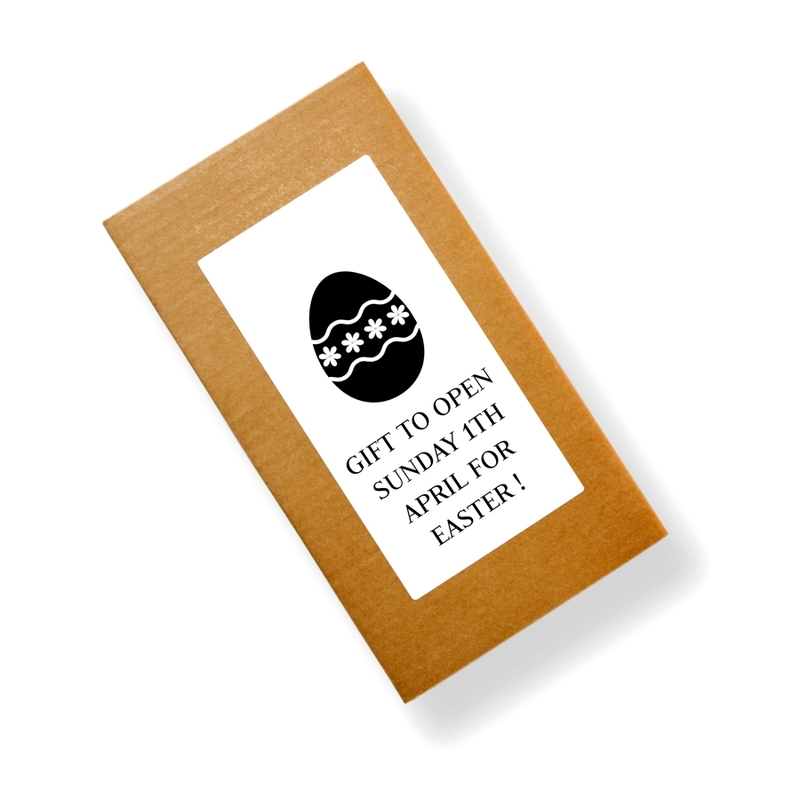 Celebrate Easter and celebrate taste by offering your children chocolate eggs of the finest quality. 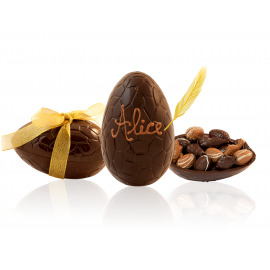 Planète Chocolat eggs are made using artisanal methods in the pure tradition of Belgian chocolate, with the finest products, 100% cocoa butter, and no preservatives. 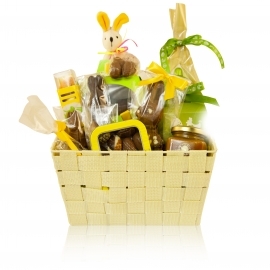 This elegant and spring-like box filled with a refined assortment of Easter eggs will certainly please your children and will give your Easter egg hunt the air of a treasure hunt.